6/3/2015 ~ Turns out, that’s not how avocado roots are supposed to look. Roots of the avocado that didn’t almost die from being under the water spout were more like a plate of spaghetti: long, thick and round. 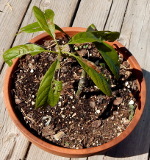 So far the third avocado I transplanted, with the benefit of two prior transplants experience, is doing best. The avocado whose roots are in the picture hasn’t made any new leaves… but I suspect that’s because it’s having to make a lot of new roots. 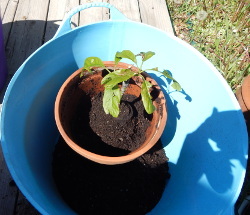 5/20/2015 ~ In transplanting the first two of my avocados I saw that their soil was much too compact and entirely wrong for the drainage loving little trees. I had prepared a better soil mix for the transplant, but it was going to be around the dense soil encasing, perhaps imprisoning, the roots. Despite my misgivings about the dense soil, I was afraid to disturb the avocado roots. So, I knocked soil from the outer edges of the root ball, then placed the avocado in its new, larger pot, with much better soil to the outside of the pot. Days later the avocado’s leaves were still browning on their tips which tends to indicate the roots are not happy. While I sat staring at the little tree, I remembered that the first avocado I ordered had arrived with large leaves and a bare root. It had done really well till I put it into a cadmium red pot, which I think killed it. 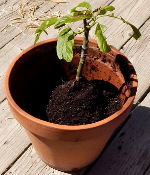 In any case, I decided I would transplant my third avocado “bare root” so that it would have only a more suitable soil mix in which to grow ~ no more soil compacted around its roots. At left is the avocado I’m transplanting. It’s going from an 8 inch clay pot to a 12.5 inch, 3.5 gallon TubTrug with holes drilled for drainage. The picture shows lots of coir and not much pumice. In fact I kept going back to my box of pumice until the mix looked about right. What isn’t shown is the old soil along with some worms I took from a pot that grew veggies last season, and the sand. 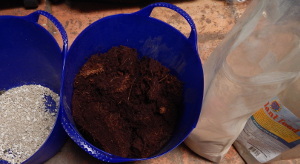 Basically, for every 2 cups of soil and 2 cups of coir I used about 1 cup of pumice. That’s a 4 to 1 ratio. 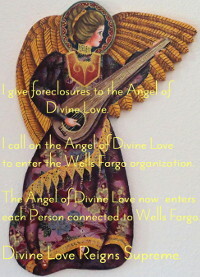 9/26/2015 ~ Since then I bought commercial potting soil for citrus and avocados. It appears to be at least half pumice. In any case, each of the avocados I transplanted died. I think that once they have root rot their life expectancy is limited. I think the avocado without root rot died when I withheld water in a misguided attempt to help it. 8/26/2016 ~ I ordered larger avocado trees from Fast Growing Trees. One arrived looking as if it had root rot, and they replaced it. I tried to save the sick tree and found that adding gypsum to the soil is supposed to help. So I added gypsum to the replacement avocado and the little one that had arrived healthy. Both are doing well. The replacement avocado is doing splendidly, actually. The root rot avocado is hanging on, and may survive. It seems to respond well to additional gypsum on the surface of the soil, then watered in. The reason to use fine textured coir rather than peat moss is that coir wets more easily. 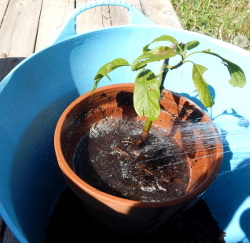 After the avocado’s soil has dried out between waterings, it can be drenched. Peat moss doesn’t take to being drenched. Peat lets the water run straight through. The thirsty plant gets little to drink, but is subjected to standing in a puddle, which it does not like. Apparently avocados are most keen to drink using the uppermost of their shallow roots. I didn’t use sand in the first bare root transplant, but in transplanting the second I saw a lot of sand in the nursery soil ~ it gave the soil a nice, almost fluffy look. Since I have a bag of sand I got some and added a few handfuls to the second transplant. The grains of sand have sort of the effect of sequins on a dress, they don’t sparkle exactly, but they do seem to be tiny points of light. 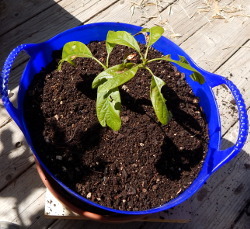 With good-drainage soil mixed and a large, empty TubTrug to hand to hold the avocado’s old soil I was just about ready to begin the bare root transplant. 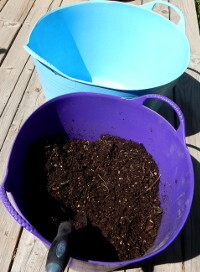 I moved the empty TubTrug close so that I could easily drop into it the soil I dug out of the avocado’s old pot by hand. The roots didn’t extend very far toward the edges of the pot, so I was able to dig out a lot of soil. I didn’t wear my neoprene gloves despite the fact that in the past working with peat moss with my bare hands appeared to cause one of my fingernails to lift. Remedy for fingernails that lift ~ Read more. I placed the avocado, still in its 8 inch pot, on the soil that had been in its pot but now was in the bottom of the large TubTrug. I hoped the little avocado tree would not be traumatized by having all its soil washed away. 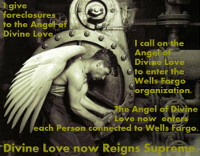 I prayed everything would go well. As I showered the avocado roots the remaining half pit fell away. 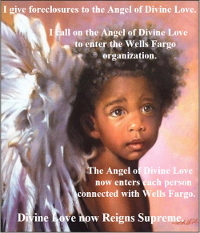 It was the large round bump to the right of the stem in the picture above. I continued showering till the shower had turned the TubTrug into a bath. When I tried gently lifting the avocado it slipped free of the pot, making it easy to spray-wash the remaining soil from its roots. Finally, there it was, the avocado’s bare root. The roots were not very well developed, making me glad I’d removed all the old soil. 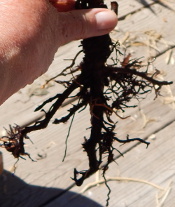 I hoped the new soil would be conducive to healthy root growth. Just to be clear, that’s not how the roots should look. I was really happy with how the avocado looked in its new home till I repotted the first avocado with sand added to the mix. I’ve got to take a picture so you can see the subtle difference for yourself. But today it’s too cold and cloudy for taking good pictures. 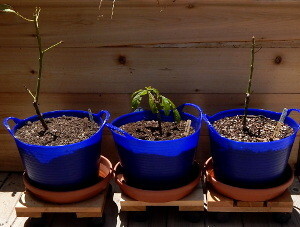 5/22/2015 ~ Each of my 3 avocados has been transplanted in a slightly different way, or into a slightly different soil mix. In order to track how the differences affect them I’ve placed a little marker in each pot to identify the kind of soil or the kind of transplant. From left to right: Bare Root Transplant into soil mix with sand, Bare Root Transplant into good-drainage soil but w/o sand, Root Ball Transplant of the entire root ball with most of its soil. 9/26/2015 ~ Each one died. 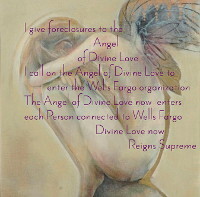 I wasn’t going to replace them, but then I decided to give it another shot. I ordered a small and large avocado tree. The large arrived looking as if it were diseased. The little one looked fine. Rather than throw out the poor, unhappy looking avocado I read as much as I could on root rot, ordered all the “prescribed” things and repotted. So far it hasn’t died. Avocado root rot ~ Read more.